I enjoy cooking. And why not? I do not know if a macaroon is truly a petit four, but I like to think of them that way. The literal translation of the French phrase "petit four" in English is "small oven", which became associated with the small cakes because the cakes were cooked in a brick oven as it was cooling, therefore not wasting any of the expensive heat. The culinary definition of petit four is a cake layered with butter cream icing and covered with pretty coloured fondant icing. 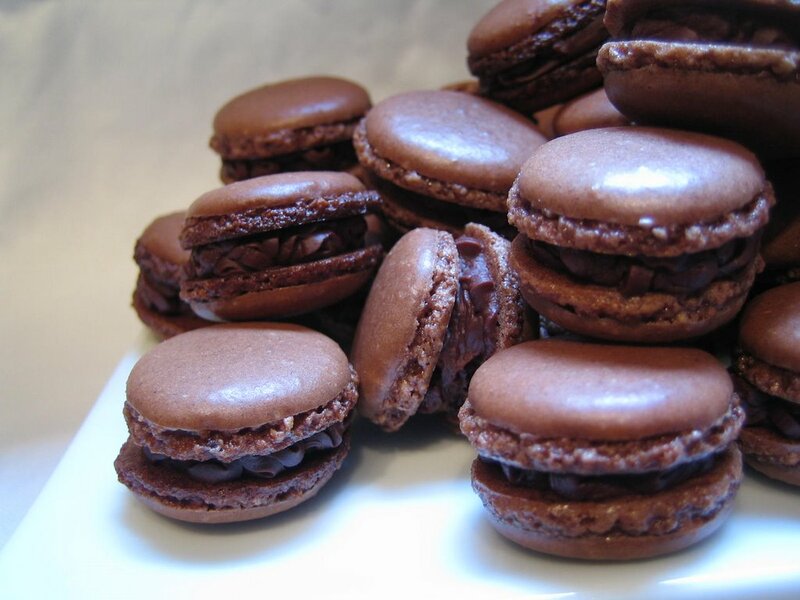 Macaroons are not quite as rich as some petit fours, but rich enough never the less. I particularly like the way the chocolate ones look like mini-hamburgers. 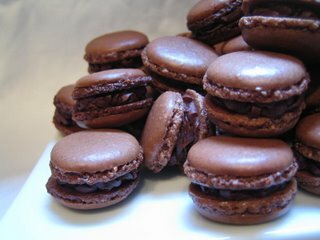 I am going to try a version with a pistachio or raspberry filling, just to push the burger image a little more - or would in fact a plain macaroon with a dark chocolate ganache filling work better - I will have to find out! splash of liqueur - I used cointreau but Amaretto would probably have been better if I had had some. Beat the egg whites, caster sugar and cream of tartar until stiff peaks form. Sieve the almonds, icing sugar and cocoa together onto the egg whites and mix well to form a paste - do not worry about keeping the egg whites full of air. Pipe (or spoon) the mixture into small, or indeed larger, blobs onto a paper lined baking sheet, leaving space for them to spread. Have more sheets than you think ready, this amount of mixture filled 3 sheets with a bit of mixture left. Leave the trays out to dry for an hour to form a skin - this gives the distinct layers. Make the ganache by heating the cream to almost boiling then pouring it over the chocolate to melt it. Beat in the liqueur and leave to cool at room temperature. Bake at 200°c for 5 to 10 minutes, keep an eye on them, they can burn quite suddenly. Leave to cool on the paper before peeling off. Beat the ganache with a wooden spoon until lighter in colour and texture then use to sandwich the macaroons. *I have often wondered what cream of tartar does in egg white concoctions like pavlova and meringue : wikipedia - Stabilises egg whites, increasing their heat tolerance and volume. Well there you go! I love researching and experimenting with recipes for things that are so easily bought these days; preserving the techniques which could so easily have been lost. Good Housekeeping. What my grandmother and mother know.